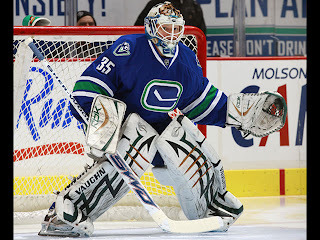 As Canucks.com is reporting, the Vancouver Canucks have recalled D Lee Sweatt, and re-assigned G Cory Schneider, F Jeff Tambellini, and F Alexandre Bolduc. This is a somewhat curious move, but can be explained by the Canucks need to be under the salary cap before the year begins. Cory Schneider was slotted to be Roberto Luongo's backup for the season, and undoubtedly will be. So why was he sent to Manitoba? Well according to Dan Murphy of Rogers' Sportsnet. the Canucks are going to activate Alexandre Burrows and Sami Salo for the first game of the year, just so they can put them on Long-Term injury to get their salaries off the books. It's a bit of a quirky move by Canucks' 'salary capologist' Laurence Gillman to ensure the best long-term strategy for the Canucks. This means that Eddie Lack would backup Roberto Luongo, while Ryan Parent and Lee Sweatt will be on the pro roster on the blue line, along with Christian Ehrhoff, Alex Edler, Kevin Bieksa, Dan Hamhuis, and Keith Ballard. If the roster sticks, the most interesting story (aside from goaltending) would be up front. The Sedin twins would begin the year with Mikael Samuelsson on the top line, while Ryan Kesler and Mason Raymond will likely be joined by either Raffi Torres or Cody Hodgson based on the current skill set of the pro roster. That leaves the likes of Manny Malhotra, Guillaume Desbiens, Jannik Hansen, Rick Rypien, Tanner Glass, and newcomer Andrew Peters to occupy the rest of the forward spots. The recent trading of D Shane O'Brien and F Darcy Hordichuk have also changed the face of the team slightly, with Ryan Parent and Andrew Peters brought in to help with the cap as well. Of course this is all a bit of fantasy, or at least not reality. As Jason Botchford reports, "to get cap compliant, Vancouver sent two players who made its team, Cory Schneider and Alex Bolduc, to Manitoba. They recalled a player who didn't in Lee Sweat and kept both Eddie Lack and Cody Hodgson — to make use of their combined $1,110,000 bonus cushion. But Sweatt, Hodgson and Lack will trade places with Bolduc and Schneider in Manitoba by Saturday. It was done in an attempt to construct a roster which "provides maximum cap flexibility." To get it, Vancouver had to be as close to their cap ceiling of $59.31 million as possible. "Laurence has done a great job since he arrived here and this was a case in point," Mike Gillis said. "It was not as easy as some people would like to think. It took a lot of patience and a lot of effort and a complete knowledge of the CBA to do it effectively." order to maximize their flexibility, the Canucks needed to get one of Alex Burrows or Sami Salo on the active roster. The player who was on will now be moved to in-season long term injury reserve. It will allow enough relief over the cap to sign Peter Schaefer by Saturday. The player who was off, was placed on off-season long-term injury and his salary was not included in the calculations which got the Canucks under 59.31 million. That cap number is the league's ceiling, $59.4 million, less the overage bonus of $90,000 from last year which was paid out to Mason Raymond. "There were were so many variables that went into what happened," Gilman said. "Not the least of which was the competition in camp. There were trades, there were injuries. "What happened (yesterday) was a culmination of all those factors. The intriguing part of it, the emergency room like part of it was conducted with the trades which were done in the last few days. All that stuff factored into it. "We were able to satisfy that which was born out of the competition in our camp. That was the cool part of it." Quite funny how they managed to get under the cap - hope it all works out!